Playing just nine holes is a great solution for the busy golf enthusiast. I have found that playing nine hole rounds has allowed me to maintain more balance in my life. I am able to get out on the course and play on those beautiful days, but still have time left over to be productive with work and family responsibilities. 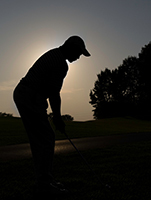 The best rates you will get for playing nine holes will usually be when the twilight rates start. Many courses have very reasonable times when their twilight rates kick in, and with the longer daylight hours during the summer, getting in nine holes and possibly more before dark is very doable. If you want to play during the day, check all your local courses and see if they offer nine hole rates. If they do not, play nine holes on courses where they are part of a county card system and/or possibly walk the round to keep the costs down. Also, getting out on the course with a low nine hole rate is sometimes better than going to the range and might even cost the same as a large bucket of balls. On course practice is an excellent way to improve you game. So use some of those rounds to work on a specific area of your game rather than concerning myself about score. So when time constraints become an issue, you do not have to give up playing golf. Play nine to help you maintain and improve your game so you can continue shooting those low scores!